Óscar Gutiérrez (born December 11, 1974) better known by his ring name Rey Mysterio, is an Mexican-American professional wrestler. He is currently working for Asistencia Asesoría y Administración (AAA). He is best known for his time in the WWE. He wrestled for Extreme Championship Wrestling (ECW) from 1995 to 1996, World Championship Wrestling (WCW) from 1996 to 2001, and the World Wrestling Entertainment/WWE from 2002 to 2015. Gutierrez is a devout Roman Catholic and crosses himself before every match. On February 26, 2015, Mysterio's contract with the WWE ended and he left after 13 years with the company. On March 3, 2015, it was announced that Mysterio resigned with Asistencia Asesoría y Administración (AAA). He made his return to the promotion at the 2015 Rey de Reyes ("King of Kings"). He teamed up with Myzteziz in the main event against El Hijo del Perro Aguayo and Pentagón Jr.
On March 20, 2015, Mysterio teamed with Extreme Tiger to face El Hijo del Perro Aguayo and Manik. In the match, Mysterio used a headscissors takedown to throw Aguayo out of the ring. When Aguayo got back into the ring, Mysterio dropkicked him in the head to set up for his finisher, the 619 which caused Aguayo to land on the middle rope. Aguayo appeared to be limp while hanging on the middle rope. The match was finished when Mysterio pinned Manik. Aguayo was later brought out of the ring and was rushed to the Del Prado hospital. He was pronounced dead around 1:00am on March 21. Mysterio and Konnan were pallbearers at his funeral. He was ranked #4 of the 500 best singles wrestlers in the PWI 500 in 1999. He was ranked #56 in the PWI Years in 2003. ↑ 1.0 1.1 1.2 1.3 "Rey Mysterio official web site". Rey Mysterio.com. Retrieved 2007-09-24. 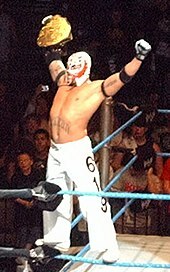 ↑ 2.0 2.1 2.2 2.3 2.4 2.5 "Rey Mysterio Profile". Online World Of Wrestling. Retrieved 2008-04-27. ↑ 3.0 3.1 3.2 "Rey Mysterio Bio". WWE. Retrieved 2008-03-01. This page was last changed on 11 September 2018, at 01:14.